Here, a group of handsome guys that held their own amidst the girls at a range of recent events. Chiwetel Ejiofor: I love the textural element of the actor’s Thom Sweeney charcoal suit, which was likewise reflected in the tie, adding visual interest to the impeccably tailored offering at the British Independent Film Awards at Old Billingsgate Market in London, England on Sunday (December 6). 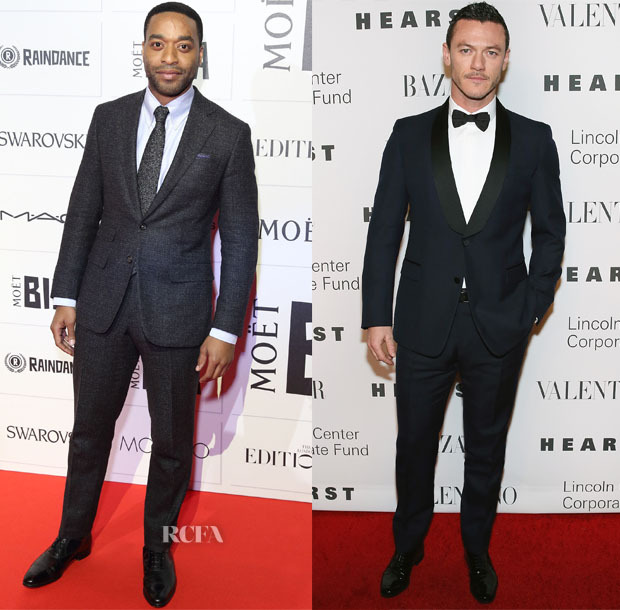 Luke Evans: Cutting an entirely dapper profile, Luke did Valentino proud in his slick tuxedo from the designer at ‘An Evening Honoring Valentino’ black-tie gala at Lincoln Center’s Alice Tully Hall in New York City on Monday (December 7). Common: At the Education Through Music 10th Anniversary Benefit Gala at Skirball Cultural Center on Sunday (December 6) in Los Angeles, California, Common stood out in a Sandro midnight-blue suit that had a laid-back spirit courtesy of the tie-less black dress shirt and slipper loafers. Channing Tatum: I believe it was the striped tie that resonated as a bit too corporate that slightly bothered me about the actor’s suited-up ensemble at ‘The Hateful Eight’ premiere at ArcLight Cinemas Cinerama Dome on Monday (December 7) in Hollywood, California.